The data are the numbers in the cells, which represent revenue in thousands of dollars. 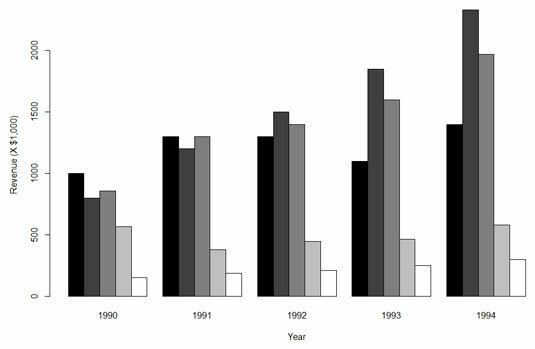 A base R bar plot of the data in this table appears in the figure. Bar plot of the data. If you had to make a presentation about these data, you’d agree that your audience would prefer the graph to the table. Although the table is informative, it doesn’t hold people’s attention. It’s easier to see trends in the graph — Satellite Services rose fastest while Commercial Launches stayed fairly level, for example. This graph is called a grouped bar plot. How do you create a plot like this one in base R? Perfect. It looks just like the table. beside = T means the bars will be, well, beside each other. (You ought to try this without that argument and see what happens.) The col = color.names argument supplies the colors you specified in the vector. The resulting plot is shown here. Initial bar plot of the data. The first two values are the x- and y-coordinates for locating the legend. (That took a lot of tinkering!). The next argument shows what goes into the legend (the names of the industries). The cex argument specifies the size of the characters in the legend. The value, 0.7, indicates that you want the characters to be 70 percent of the size they would normally be. That’s the only way to fit the legend on the graph. (Think of “cex” as “character expansion,” although in this case it’s “character contraction.”) fill = color.names puts the color swatches in the legend, next to the row names. Setting bty (the “border type”) to "n" (“none”) is another little trick to fit the legend into the graph.